JD Sports ireland Vouchers, Discount offers and Free Gifts in April 2019. Redeem a JD Sports ireland Voucher from voucher-code.ie and get your benefit at jdsports.ie. Never miss again a JD Sports ireland voucher or sale offer! JD Sports Ireland is part of the JD Sports group, the UK’s leading sports fashion retailer which offers an extensive range of trainers, footwear, clothing and accessories for Men, Women and Kids - of which 80% is exclusive to JD Sports! The current product range covers all the popular brands such as adidas Originals, Nike, Converse, Puma, Canterbury, New Balance, Asics, Lacoste, plus many more including the JD’s exclusive brands McKenzie, Brookhaven, Duffer of St George, Supply & Demand, Diadora, Fila and Carbrini. There is also FREE Delivery to Ireland on orders over €60, free delivery and returns to 25 stores and free returns through Parcel Motel. 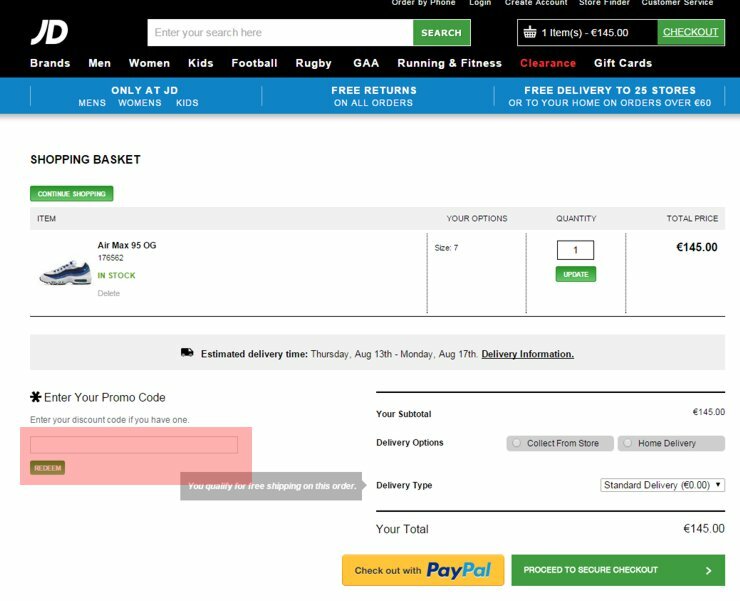 Please enter a JD Sports ireland voucher code directly in the 'Enter Your Promo Code' box on the basket page and activate encashment by hitting the "REDEEM" Button. Discounts will be applied only if the code is valid and meets the minimum value required.